Make any occasion a little sweeter with this 5 lb. white cake mix! Providing all the ingredients you need, this mix makes baking easy, while still offering a homemade taste. You can even add your favorite flavorings to the mix. Save time baking from scratch, and just add water, mix, and bake! I love baking and eating cake so I have tried my share of cakes. This is top notch and compares to some really pricy brands. A nice value white cake mix that is great for making our strawberry shortcake. The cake rises up nice and fluffy and has a great taste. I didn't like this product much, it came out pretty dry, even with added oil and egg. It also did not have very much flavor. We appreciate your review, Leah! If you are looking for more information on this product, please contact our Customer Solutions team. Working with the white cake mix was great! The final product produced a nice consistence to form evenly round cake balls. I will buy this product again and recommend others as well! If you are looking for a basic yet moist and delicious white cake mix, then buy this stuff. It is absolutely delicious. Thank you for shipping everything so quickly too. this cake is a great deal for the amount of cake it makes at such a great price it also taste pretty good as well. Absolutely some of the freshest cake mix I have tasted and doesn't go stale after a few days like most. I recommend purchasing a cake cover to house the mix. It also has many purposes. great price for the amount you get for the cake mix, as well as taste , and the cake mix was light and fluffy , I would order this again. thank you. This cake mix took a little getting used to. We don't follow the directions anymore as it kept turning out runny and a pourable consistency. The flavor however is really good and we can do all sorts of things with it. adding food coloring or extracts is easy. Beware of the instructions, but otherwise, good buy! This comes out a little dry, but it is easy and it does make a very good cake. A little butter and vanilla flavoring and an egg...and everyone thinks that I made it from scratch. So far I have loved it. Bakes up fluffy and tastes good. I add extra flavoring to it to make sure it tastes good. I think the flavor overall is a little bland but with a little flavoring it is pretty good! it was a little dry so i had to use more oil this product needs to be a different formal or something i will use for a more dense cake. Made a cake for a party n turned out real well. Everybody liked it. I had used a little flavor extract to change n turned out real well. 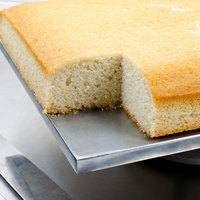 Super yummy and moist white cake mix that is easy to prepare and makes a great layer cake for our specialty cakes. Terrific consistency and holds up well when stacking the layers. The White cake mix was good. I wouldn't recommend a bakery or caterer using this. The product is ok, but not outstanding. Cake is not real moist . This White Cake Mix makes wonderful cakes and I also use it to make cookies. The sweetness of this cake mix is just right. I plan on order more. I was not a fan of this particular brand of cake mix. It just tasted very artificial to me and I won't use it even if it is just for a demo cake. Convinent to use product. Wasnt exactly what we were used to so we ended up tossing the rest out. Cake was not the best tasting product. This cake mix is better than the box cake mixes in the store. Baked up nice and fluffy to my suprise. You can make this your own by adding your own flavorings.I will definetly be buying again. A great white cake mix that is a great buy and super easy to prepare. We are very pleased with how it turned out and makes a great tasting cake. OH MY!!!! I Just received my order and I was able to figure out a recipe (adding in my own ingredients) for a smaller batch for testing and lets just say.......OH MY!!!!! This product is amazing!!! I will definitely re-order!!!! I'm not a business - just a home baker. Followed instructions for one pound of mix adding one cup of water, 350 degrees for 30 minutes. The cake collapsed in the center and seemed to be a little underdone. The next cake was one pound of mix, one cup of water, 325 degrees for 45 minutes and I used a cake strip around the pan. The cake turned out fine. I like the fact that I only have to add water to the mix. I don't think I saved any money using this mix but I would order it again. I'm open to suggestions on adding flavoring, butter, etc. This white cake mix has the traditional birthday cake flavor, and is very sweet. The consistency is good, and my cake baked nicely. The packaging does not include instructions, but they can be found online. You'll need a digital scale if you're going to make smaller batches, as the instructions only reference using the full bag of mix. I loved the taste and how most it was! I just added oil and egg and it came out Pefect. I definitely will be reordering again. A very tasty and easy to make mix at a wonderful price. The white cake mix is perfect for making tasty layer cakes. It is so easy to follow and mix up. A wonderful white cake mix that makes a perfect rectangular sheet cake. We use these to make birthday cakes. The cake Is very moist and delicious. I do really like that you can do so much with the white cake mix. Adding flavor to the white cake is easy and doesn't alter the cake batter. It's like a basic base cake. I will order more of this. This is very easy to prepare. Just add water and mix! Each bag makes approx. 60 regular size cupcakes. Gets the job done quick and efficient. Cake is moist fluffy, and delicious. Pairs well with fruit fillings and pudding. I love to use this mix for show cakes. It's quick fast and easy to use. I love how simple and customizable this mix is. I've made strawberry, sprinkle cake, even chocolate cake just by adding a few things. I love that i don't need eggs or oil. This white cake base makes our spice and pumpkin spice cake unbelievable moist and tasty. It also is a great base for our peppermint swirl cake. I helps with so many different cakes. This 5lb white cake mix makes about 5 regular sized cakes. I used it to make a large sheet sized birthday cake for a crowd. The cake was delicious and I received many compliments. The cake had a professional quality to it. It didn't taste like a store bought cake mix at all. I will definitely buy this again in the future. Theses mixes are great. Just add water and you're set. You can add milk and/or more if desired. White bases are easy to color and flavor too. The white cake mix has a good flavor and it is so convenient- great for large quantities. I added several different flavors to the mix for variety and they turned out fine. A great base flavor ! I love this mix! It baked up evenly and is a great base for secret ingredients. It's convenient and the flavor and texture are great. I am unfortunately not a huge fan of this mix. I love the ease of only adding water, but baking it was horrible. The outside would get overdone while the middle would stay raw. I tried several things to fix this and none of them worked. I wanted to try another mix so I hought this mix. The texture is great if you add your own ingredients, I followed the instructions and the results were sort of a dry texture. Other than that I was thankful for the product. This mix tried twice. Each time I baked exactly to manufacture directions. And each time the sides baked to fast, center was still raw. And the part that was baked tasted like a imitation vanilla. Thought it'd save some time, but it didn't. Just no. The flavor is awful. Generic . I even tried add ins and it didn't help. I would never serve this to my customers and I am so thankful that I didn't order a case! I purchased this mix for some of my holiday baking this white cake mix was nice and moist and easy to use. One bag yielded me three full sheet Pineapple Upside Down Cakes. Excellent flavor and moistness. The cake mix is easy to make and bakes consistently each time. It makes for a nice level cake as it bakes. The White cake mix was a pretty good base for the cakes I was trying to make. I added almondmilk instead of water, and then I added vanilla. It baked well, and the consistency was good. This cake mix is very versatile. You can add any flavorings to it.. Vanilla, butter almond, etc. Watch your bake time, and do not add too much water. Watch your weighing, and bake time with this cake. It will come out a tad bit dry if even slightly over baked with using the mix on it's own. I like to add a mix of our secret ingredients, then, it comes out beautiful when used as a base for a white cake. The mix also tints well with gel food colors. White cake mix was more than easy to make. Cupcakes baked up nice and fluffy with and no one could tell that I changed the recipe. I have used this white cake mix for last minute desserts. It is convenient in that you only need to add water. As for flavor and moistness, make sure you do not overbake. The flavor is so so, and needs a spectacular, tasty icing to give it a flavor boost. This helps you if you are baking cakes for large groups. It is very economical and easy for the cost of the product. Perfect for bake sales. Makes very good tasting cake with nice texture. Five pounds of mix does not make five 9x13 cakes, more like three. Easy to use, no need to add eggs or oil. The taste was "ok" but I'm not a fan of Thais product. You have to tweak it too much to get the consistency right. For all that work I'd just spend time doing it from scratch. Thought it would be a time saver but it's not. Direction on bag are only for preparing the whole bag. Not the best flavored cake mix i have had but texture is beautiful. Great if making a big cake that needs good texture to hold up. I made it into a lemon flavored cake for a friend and they loved it, so some liked the taste. Just not for me. I tried this white cake for the first time and I was blown away by the moistness and flavor. It tastes like a made-from-scratch cake all the way and the texture is amazing. It rises perfectly while keeping it's texture moist. We will be using this at our bakery as much as possible from now on. This cake mix is aweful. It wasn't dense but it has a very "box" mix taste....it's almost flavorless except for that taste. The color varies from the edge to the center drastically which is why I'm guessing they pictured it with the edges cut. I could never serve this. Now I'm stuck with 5 more bags and my kids won't even eat it. SAVE YOUR MONEY...would never buy this product again. We appreciate your review, Kristy! If you are looking for a better way to prepare this cake mix, please contact our Customer Solutions team. You will need a good storage container for this product, as it arrives in a bag. The bag is sturdy enough, but you'll want an airtight seal if you do not use all the mix at once. The cake mix is as white as expected. Excellent product! This is a great mix to make flavored cakes. you only need to add a liquid so you can let your imagination fly! orange juice, pineapple juice or just water with some flavoring works well. Mash up fresh blueberries and add water to reach needed amount and it makes a wonderful blueberry cake or muffins. love using different colors with this one. Great for making rainbow cakes. I was really pleased with this product. Very moist and easy without having to add alot of ingredients. I reccomend this product for your cake baking. The flavor of this cake is very simple and is begging to be dressed up, but because of it being so simple, it works fantastically to speed up your baking process! We use this to make birthday cakes and adding different sprinkles to the mix to make it colorful. It's moist, it rises like regular cake and even adding milk instead of water makes it taste a little more homemade. Very easy, versatile & inexpensive cake mix! It's always handy to have a good white cake mix. This is a solid basis for any colored or flavored cupcakes/ cakes we might make. Our favorite right now is making it into coconut cream cupcakes. Not a fan ... It is SO dense even when making the batter super runny with extra water . I had thought it would be fluffy according to reviews & had a box cake mix taste - far from scratch. Going to keep trying with the mix I have left over but so far I am not going to purchase it again --- I would love some more suggestions on how to make it not so thick & heavy ? Thank you for your review! Please see our Baking Instructions sheet on the product page for helpful baking tips. Our product specialists recommend using 8 fl. oz. of water for every 1 lb. of cake mix. As always, please feel free to contact a Customer Solutions Representative for more help. Typically, I make all of my cakes from scratch but I purchased this item to accommodate a last minute event. I received several compliments on the finished product and everyone was quite satisfied. I would purchase this product again. This is a basic white cake mix, but it's got wonderful flavor. Anything you add to this will just add that much for flavor. The options are endless, but this is a great place to start for making a cake! Did not particularly like the cake mix. Tasted salty and did not raise. Contacted customer service and they refunded for it. I will try again, it's economical if its good!! This mix is one of my go to mixes for white cake and cupcakes. It was a bit of a trial and error getting the right consistency. I relieved to get the moistest cake and cupcakes to pull them out just a bit early before they have a golden ring or color. I also added more vanilla and almond extract to the batter. Everyone loves it! A good white cake mix. Bakes up nice and isn't heavy or dense. Has a nice mild flavor and is truly white which makes it nice for wedding cakes. By far my favorite cake mix is this white cake mix. It makes a nice light cake that rises well and tastes incredible. It's perfect topped with fruit. While the cake was tastey it was very dense and had the consistency of pound cake rather white cake. Did not make for a good cake or cupcake. Thanks for your review. To make the cake less dense, you can add a little more water. Be sure to measure the cake by weight and the water by volume. The cake can also be doctored up by adding extra flavorings. I use this mix for making cakes for my cake decorating classes. It holds up well to stacking and tastes great with buttercream. Moist and a bit spongy. I love Webstraurant and have been quite happy with the products I have gotten from here! I had high hopes for this mix since I teach cake decorating classes for kids and was hoping to save a litte money and offer an edible cake. However this mix lacks flavor, has a spongy texture, and I feel I can barely serve this to kids. It would take alot to doctor it up and then I might as well make my usual cake recipe. This is what I consider "institutional food" rather than gourmet. If that's what you need, it will work for you. Not only is this much more convenient than the store bought cake mixes, it is so much more economical! The mix tastes great made according to the instructions, but adding a bit more egg yolks and butter makes for an even richer tasting cake! This cake mix was everything we wanted! It was so easy to make 400 cookies with this mix, instead of having to purchase the ingredients separately and they turned out great! The 5lb. White Cake Mix. It is great fr when we have a cake day at school. All you have to do is add water and bake. The kids and staff love it. We all have a hand in decorating them. This is a great product. It comes out great and consistent every single time, which I really appreciate. It is a great brand and a great price. Love the simple white cake. Before I tried this ready made cake mix I made my own from scratch and I can honestly say this mix is on par with what I would make from scratch. Makes a great cake! This is really a great product. It is so convenient. I use it for making all size cakes and they seem to always turn out pretty well. i decided to try this to help me save time and money for my bakery. i am giving it 2 stars. where the cake itself, has a great flavor, the first attempt at making the batter, it came out too runny. i then added more mix to make it like a traditional batter texture. after baking, it was like eating biscuits. the texture was awful. i've tried using it several times now, testing the mix to water ration, and everytime i've had a bad result. Simple to make. Just add water. The cake came out perfect. It was a little dense but it may have been from the proportions or weather here. I used it to make one small cake, 2 cups of mix to 1 cup of water. The recipe calls for 1 lb mix to 1 cup water so I guestimated it as I did not have a scale to measure. But it still turned out fine. Quick and easy to make. I love this cake mix! I had gotten another brand from my food distributors, and did not like the way it tasted to "box like" I used this for cupcakes and got rave reviews! The 5LB Cake Mix. Is Perfect for baking that special cake. It takes alot of mix when your decorating cakes,For those special occasions. The customers that order the white have been very happy with the tast .They say it's not dry. like some other bakers cakes .We love it. I LOVE this cake mix! It's very fluffy and tastes great! It does come in a large quantity, but we seem to use it all before it goes bad! Excellent mix!